"P-80" redirects here. For other uses, see P-80 (disambiguation). The Lockheed P-80 Shooting Star was the first jet fighter used operationally by the United States Army Air Forces (USAAF). Designed and built by Lockheed in 1943 and delivered just 143 days from the start of the design process, production models were flying, and two pre-production models did see very limited service in Italy just before the end of World War II. Designed with straight wings, the type saw extensive combat in Korea with the United States Air Force (USAF) as the F-80. America's first successful turbojet-powered combat aircraft, it helped usher in the "jet age" in the USAF, but was outclassed with the appearance of the swept-wing transonic MiG-15 and was quickly replaced in the air superiority role by the transonic F-86 Sabre. The F-94 Starfire, an all-weather interceptor on the same airframe, also saw Korean War service. The closely related T-33 Shooting Star trainer would remain in service with the U.S. Air Force and Navy well into the 1980s, with the last NT-33 variant not retired until April 1997. Many still serve in a military role in foreign air arms or are in private hands. The XP-80 had a conventional all-metal airframe, with a slim low wing and tricycle landing gear. Like most early jets designed during World War II—and before the Allies captured German research data that showed the speed advantages of swept-wings—the XP-80 had straight wings, similar to previous propeller-driven fighters. It was the first operational jet fighter to have its engine in the fuselage, a format previously used in the pioneering German Heinkel He 178 V1 of 1939, and the slightly later British Gloster E.28/39 demonstrator of 1941. Other early jets generally had two engines because of their limited power, these being mounted in external nacelles for easier maintenance. With the advent of more powerful British jet engines, fuselage mounting was more effective, and it was used by nearly all subsequent fighter aircraft. Concept work began on the XP-80 in 1943 with a design being built around the blueprint dimensions of a British Halford H-1 B turbojet (later called the de Havilland Goblin), a powerplant to which the design team did not have actual access. Lockheed's team, consisting of 28 engineers, was led by the legendary Clarence L. "Kelly" Johnson. This teaming was an early product of Lockheed's Skunk Works, which surfaced again in the next decade to produce a line of high-performance aircraft beginning with the F-104. The impetus for development of the P-80 was the discovery by Allied intelligence of the Me 262 in spring 1943, which had made only test flights of its own first quartet (the V1 through V4 airframes) of design prototypes at that time, all fitted with retracting tailwheel landing gear. After receiving documents and blueprints comprising years of British jet aircraft research, the commanding General of the Army Air Forces, Henry H. Arnold, believed an airframe could be developed to accept the British-made jet engine, and the Materiel Command's Wright Field research and development division tasked Lockheed to design the aircraft. With the Germans and British clearly far ahead in development, Lockheed was pressed to develop a comparable jet in as short a time as possible. Kelly Johnson submitted a design proposal in mid-June and promised that the prototype would be ready for testing in 180 days. The Skunk Works team, beginning 26 June 1943, produced the airframe in 143 days, delivering it to Muroc Army Airfield on 16 November. The project was so secret that only five of the more than 130 people working on it knew that they were developing a jet aircraft, and the British engineer who delivered the Goblin engine was detained by the police because Lockheed officials could not vouch for him. After the engine had been mated to the airframe, foreign object damage during the first run-up destroyed the engine, which delayed the first flight until a second engine (the only other existing) could be delivered from Britain. The first prototype (44-83020) was nicknamed Lulu-Belle (also known as "the Green Hornet" because of its paint scheme). Powered by the replacement Halford H1 taken from the prototype de Havilland Vampire jet fighter, it first flew on 8 January 1944, with Lockheed test pilot Milo Burcham at the controls. Following this flight, Johnson said, "It was a magnificent demonstration, our plane was a success – such a complete success that it had overcome the temporary advantage the Germans had gained from years of preliminary development on jet planes." The donated British jet program data had no doubt proved invaluable. 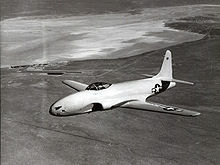 In test flights, the XP-80 eventually reached a top speed of 502 mph (808 km/h; 436 kn) at 20,480 ft (6,240 m), making it the first turbojet-powered USAAF aircraft to exceed 500 mph in level flight, following the August 1944 record flight of 502 mph (808 km/h; 436 kn) by a special high-speed variant of the Republic P-47 Thunderbolt. Contemporary pilots, when transitioning to pioneering jets like the Shooting Star, were unused to flying at high speed without a loud reciprocating engine and had to learn to rely on the airspeed indicator. The second prototype, designated XP-80A, was designed for the larger General Electric I-40 engine (an improved J31, later produced by Allison as the J33). Two aircraft (44-83021 and 44-83022) were built. 44-83021 was nicknamed the Gray Ghost after its "pearl gray" paint scheme, while 83022, left unpainted for comparison of flight characteristics, became known as the Silver Ghost. The XP-80A's first test flight was unimpressive, but most of the problems with the design were soon addressed and corrected in the test program. Initial opinions of the XP-80A were not positive, with Lockheed Chief Engineering Test Pilot Milo Burcham commenting that an aircraft he very much enjoyed (powered by the Halford engine) had now become a "dog." The XP-80As were primarily testbeds for larger, more powerful engines and air intake design, and consequently were larger and 25% heavier than the XP-80. The P-80 testing program proved very dangerous. Burcham was killed on 20 October 1944 while flying the third YP-80A, 44-83025. The Gray Ghost was lost on a test flight on 20 March 1945, although pilot Tony LeVier escaped. Newly promoted to chief engineering test pilot to replace Burcham, LeVier bailed out when one of the engine's turbine blades broke, causing structural failure in the aircraft's tail. LeVier landed hard and broke his back, but returned to the test program after six months of recovery. The top-scoring World War II USAAF ace Major Richard Bong was also killed on an acceptance flight of a production P-80 in the United States on 6 August 1945. Both Burcham and Bong crashed as a result of main fuel pump failure. Burcham's death was the result of a failure to brief him on a newly installed emergency fuel pump backup system, but the investigation of Bong's crash found that he had apparently forgotten to switch on this pump, which could have prevented the accident. He bailed out when the aircraft rolled inverted but was too close to the ground for his parachute to deploy. After the war, the USAAF compared the P-80 and Me 262A concluding, "Despite a difference in gross weight of nearly 2,000 lb (900 kg), the Me 262 was superior to the P-80 in acceleration, speed and approximately the same in climb performance. The Me 262 apparently has a higher critical Mach number (the Me 262A's being at M 0.86), from a drag standpoint, than any current Army Air Force fighter." The costs are in approximately 1947 United States dollars and have not been adjusted for inflation. The Shooting Star began to enter service in late 1944 with 12 pre-production YP-80As, one of which was destroyed in the accident in which Burcham was killed. A 13th YP-80A was modified to the sole F-14 photo reconnaissance model and lost in a December crash. Four were sent to Europe for operational testing (demonstration, familiarization, and possible interception roles), two to England and two to the 1st Fighter Group at Lesina Airfield, Italy, but when test pilot Major Frederic Borsodi was killed in a crash caused by an engine fire on 28 January 1945, demonstrating YP-80A 44-83026 at RAF Burtonwood, the YP-80A was temporarily grounded. Before World War II ended, however, two American pre-production Lockheed YP-80A Shooting Star fighter jets did see limited service in Italy with the USAAF on reconnaissance, in February and March 1945. Because of delays in delivery of production aircraft, the Shooting Star saw no actual combat during the conflict. The initial production order was for 344 P-80As after USAAF acceptance in February 1945. A total of 83 P-80s had been delivered by the end of July 1945 and 45 assigned to the 412th Fighter Group (later redesignated the 1st Fighter Group) at Muroc Army Air Field. Production continued after the war, although wartime plans for 5,000 were quickly reduced to 2,000 at a little under $100,000 a copy. A total of 1,714 single-seat F-80A, F-80B, F-80C, and RF-80s were manufactured by the end of production in 1950, of which 927 were F-80Cs (including 129 operational F-80As upgraded to F-80C-11-LO standards). 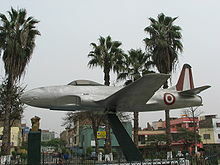 However, the two-seat TF-80C, first flown on 22 March 1948, became the basis for the T-33 trainer, of which 6,557 were produced. On 27 January 1946, Colonel William H. Councill flew a P-80 nonstop across the U.S. to make the first transcontinental jet flight. He completed the 2,457 miles (3,954 km) run between Long Beach and New York in 4 hours 13 minutes 26 seconds at an average speed of 584 mph (507 kn; 940 km/h) to set a Fédération Aéronautique Internationale record. 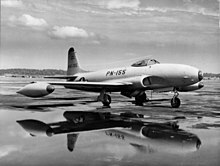 The P-80B prototype, modified as a racer and designated P-80R, was piloted by Colonel Albert Boyd to a world air speed record of 623.73 mph (1,004.2 km/h) on 19 June 1947. The P-80C began production in 1948; on 11 June, now part of the USAF, the P-80C was officially redesignated the F-80C. The USAF Strategic Air Command had F-80 Shooting Stars in service from 1946 through 1948 with the 1st and 56th Fighter Groups. The first P-80s to serve in Europe joined the 55th Fighter Group (later redesignated the 31st FG) at Giebelstadt, Germany, in 1946, remaining 18 months. When the Soviet Union blockaded Berlin, a squadron of the 56th FG led by Colonel David C. Schilling made the first west-to-east Atlantic crossing by single-engined jets in July, flying to Germany for 45 days in Operation Fox Able I. 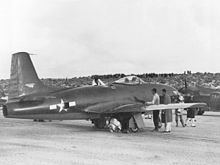 [N 1] Replaced by the newly F-80-equipped 36th Fighter Group at Fürstenfeldbruck, the 56th FG conducted Fox Able II in May 1949. That same year F-80s first equipped the 51st Fighter Group, based in Japan. 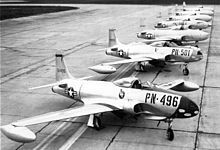 The 4th (Langley Air Force Base, Virginia), 81st (Kirtland Air Force Base, New Mexico), and 57th (Elmendorf Air Force Base, Alaska) Fighter Groups all acquired F-80s in 1948, as did interceptor squadrons of the Air Defense Command. The first Air National Guard unit to fly the F-80C was the 196th FS of the California ANG in June 1947. Several P-80A Shooting Stars[N 2] were transferred to the United States Navy beginning 29 June 1945, retaining their P-80 designations. At Naval Air Station Patuxent River, one Navy P-80 was modified with required add-ons, such as an arrestor hook, and loaded aboard the aircraft carrier USS Franklin D. Roosevelt at Norfolk, Virginia, on 31 October 1946. The following day the aircraft made four deck-run takeoffs and two catapult launches, with five arrested landings, flown by Marine Major Marion Carl. A second series of trials was held on 11 November. The U.S. Navy had already begun procuring its own jet aircraft, but the slow pace of delivery was causing retention problems among pilots, particularly those of the Marines who were still flying Vought F4U Corsairs. 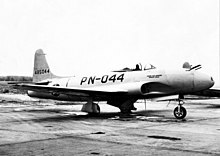 To increase land-based jet-transition training in the late 1940s, 50 F-80Cs were transferred to the U.S. Navy from the U.S. Air Force in 1949 as jet trainers. Designated TO-1 by the Navy (changed to TV-1 in 1950), 25 were based at Naval Air Station North Island, California, with VF-52, and 16 assigned to the Marine Corps, equipping VMF-311 at Marine Corps Air Station El Toro. These aircraft were eventually sent to reserve units. The success of these aircraft led to the procurement by the Navy of 698 T-33 Shooting Stars (as the TO-2/TV-2) to provide a two-seat aircraft for the training role. Lockheed went on to develop a carrier-capable version, the T2V SeaStar, which went into service in 1957. Shooting Stars first saw combat service in the Korean War, employing both the F-80C variant and RF-80 photo-recon variants. The F-80 flew both air-to-air and air-to-ground sorties, claiming several aerial victories against North Korean Yak-9s and Il-10s. On 8 November 1950, the first American claim for a jet-versus-jet aerial kill was made when Lieutenant Russell J. Brown, flying an F-80, reported that he shot down a MiG-15. Soviet records showed that the MiG survived the encounter. Despite initial claims of success, the speed of the straight-wing F-80s was inferior to the 668 mph MiGs. The MiGs incorporated German research that showed that swept wings delayed the onset of compressibility problems, and enabled speeds much closer to the speed of sound. F-80s were soon replaced in the air superiority role by the North American F-86 Sabre, which had been delayed to also incorporate swept wings into an improved straight-winged naval FJ-1 Fury. However, F-80 pilots still claimed to have destroyed a total of six MiG-15s in aerial combat. When sufficient Sabres were in operation, the Shooting Star flew exclusively ground-attack missions, and were also used for advanced flight training duties and air defense in Japan. By the end of hostilities, the only F-80s still flying in Korea were photo-reconnaissance variants. 8th Fighter-Bomber Wing (35th, 36th, and 80th Fighter-Bomber Squadrons), based at Suwon Air Base, was the longest-serving F-80 unit in Korea. It began missions from Japan in June 1950 and continued to fly the Shooting Star until May 1953, when it converted to F-86 Sabres. 49th Fighter-Bomber Group (7th, 8th, and 9th FBS) deployed to Taegu AB (K-2), Korea, from Japan in September 1950 and continued fighter-bomber missions in the F-80C until June 1951, when it converted to the F-84 Thunderjet. 51st Fighter-Interceptor Wing (16th and 25th FIS) operated F-80Cs from Kimpo AB (K-14) and Japan from September 1950 to November 1951 when it transitioned to F-86s. 35th Fighter-Interceptor Group and two squadrons, the 39th and 40th FIS, went to Pohang, Korea in July 1950, but converted to the P-51 Mustang before the end of the year. 8th Tactical Reconnaissance Squadron, later redesignated 15th TRS, served from 27 June 1950 at Itazuke, Japan, Taegu (K-2), and Kimpo (K-14), South Korea, until after the armistice. The squadron also utilized a few converted RF-80Cs and RF-86s. Of the 277 F-80s lost in operations (approximately 30% of the existing inventory), 113 were lost to ground fire and 14 to enemy aircraft. F-80s are credited by the USAF with destroying 17 aircraft in air-to-air combat and 24 on the ground. Major Charles J. Loring, Jr. was posthumously awarded the Medal of Honor for his actions while flying an F-80 with the 80th Fighter-Bomber Squadron, 8th Fighter-Bomber Wing on 22 November 1952. 1714 production aircraft were delivered to the Air Force prior to any conversions or redesignations, with their original block numbers. Prototype powered by a de Havilland-built Halford H.1B turbojet and first flown 8 January 1944, one built. Production prototype variant powered by a General Electric I-40 turbojet, increased span and length but wing area reduced, two built. 12 pre-production aircraft. One aircraft, 44-83027, lent to Rolls-Royce Limited and used for development of the Nene engine. One built from YP-80A order (44-83024), lost in midair collision with B-25 Mitchell chase plane on 6 December 1944; USAAF photo reconnaissance prototype. 344 block 1-LO aircraft; 180 block 5-LO aircraft. Block 5 and all subsequent Shooting Stars were natural metal finish. Fitted with 225 US gal (187 imp gal; 850 l) tiptanks. Unknown number of conversions from P-80A, all redesignated FP-80A. Modified P-80A 44-85201 with hinged nose for camera equipment. 152 block 15-LO; operational photo reconnaissance aircraft. USAF designation of FP-80A, 66 operational F-80A's modified to RF-80A standard. Modified P-80A 44-85042 with experimental nose contour. Modification of XP-80B to racer. USAF designation of P-80C; 128 F-80A modified to F-80C-11-LO with J-33-A-35 engine and ejection seat installed; fitted with 260 US gal (220 imp gal; 980 l) tiptanks; major P-80 production version. 70 modified F-80A and F-80C, and six modified RF-80A, to RF-80C and RF-80C-11, respectively; upgraded photo recon plane. Designation given to number of F-80As converted into drone directors. Project Bad Boy F-80 conversions by Sperry Gyroscope to target drones. Q-8 was initially proposed as designation for the QF-80. First designation for TF-80C trainer prototype. U.S. Navy variant of F-80C; 49 block 1-LO and one block 5-LO aircraft transferred to USN in 1949; 16 initially went to U.S. Marine Corps. 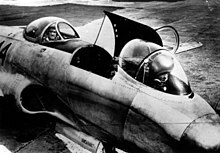 Lockheed also produced a two-seat trainer variant with a longer fuselage, the T-33, which remained in production until 1959 and was produced under license in Japan and Canada. The trainer was used by more than 20 different countries. A total of 6,557 T-33s were built and some are still flying. 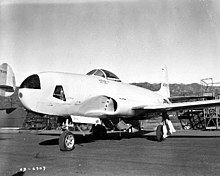 Two TF-80Cs were modified as prototypes for the F-94 Starfire, an all-weather fighter produced in three variants. 33 F-80Cs delivered starting in 1958, withdrawn from service in 1973.
around 30 F-80Cs delivered from 1958 on, last ones retired from service in 1974. 16 F-80Cs delivered starting in 1958, retired by 1966. 16 F-80Cs delivered between 1957 and 1960, six returned to the United States in 1965. 16 F-80Cs delivered starting in 1958, used by the 13th Fighter-Bomber Group until the type was phased out in 1973.
at least 17 F-80Cs delivered, withdrawn from use in 1971. 49-0433 – Museu Aeroespacial in Rio de Janeiro, Brazil. 49-0787 – Museo Nacional Aeronautico y del Espacio, Los Cerrillos Airport, Santiago, Chile. Lockheed XP-80 "Lulu-Belle" at the National Air and Space Museum, Washington, D.C.
44-83020 (Lulu-Belle) – National Air and Space Museum in Washington, D.C.. First flown on 8 January 1944, it was restored right after the 1976 opening of the National Air and Space Museum and is still in their collection. 44-84999 – Hill Aerospace Museum at Hill AFB, Utah. This airframe is a T-33A that has been modified and painted to resemble a P-80. 44-85123 – Air Force Flight Test Museum at Edwards Air Force Base in California. Currently undergoing restoration. This aircraft set transcontinental speed record in January 1946, closed circuit speed record in June 1946, and won the Thompson Trophy Race in September 1946. Was then used to test nose fairing and wing designs. 44-85125 (displayed as 44-85152) – Kalamazoo Air Zoo in Kalamazoo, Michigan. 44-85391 (front of fuselage) – Air Victory Museum, Medford, New Jersey. 44-85488 – Planes of Fame in Chino, California. 45-8357 – Museum of Aviation at Robins Air Force Base, Warner Robins, Georgia. 45-8490 – Castle Air Museum in Atwater, California. 45-8501 – Kirtland AFB, Albuquerque, New Mexico. 45-8517 – Anna Jordan Park, Baton Rouge, Louisiana. 45-8612 – Pima Air & Space Museum in Tucson, Arizona. 45-8704 – Aerospace Museum of California in Sacramento, California. 47-0171 – Iowa Gold Star Military Museum, Camp Dodge, Des Moines, Iowa. 47-0215 – Reflections of Freedom Air Park, McConnell AFB, Wichita, Kansas. 47-1837 – Redesignated USMC TO-1 BuNo 33840 at the Flying Leatherneck Aviation Museum at MCAS Miramar, San Diego, California. 47-1392 – Naval Air Station Joint Reserve Base Fort Worth, Fort Worth, Texas. 48-0868 – EAA Airventure Museum in Oshkosh, Wisconsin. 49-0432 (displayed as 49-417) – Air Force Armament Museum at Eglin AFB, Florida. 49-0696 – National Museum of the United States Air Force in Dayton, Ohio. 49-0710 – Mid-America Air Museum, Liberal, Kansas. 49-0719 – in storage awaiting restoration at Yanks Air Museum in Chino, California. 49-1853 – Veteran's Memorial Square, Holloman AFB in New Mexico. 49-1872 – Pueblo Weisbrod Aircraft Museum, Pueblo Memorial Airport, Pueblo, Colorado. 44-85200 – National Museum of the United States Air Force in Dayton, Ohio. This aircraft was specially modified for racing by equipping it with a smaller canopy, a shorter wing, and redesigned air intakes. On 19 June 1947, it was flown by Colonel Albert Boyd to a new world speed record of 623.73 mph (1,004.2 km/h), equaling Heini Dittmar's 623 mph (1,004 km/h) unofficial record velocity in one of the Me 163A liquid-fueled rocket fighter prototypes, set on 2 October 1941 after being towed to the height for the attempt by a Bf 110. The P-80R aircraft was shipped to the Museum from Griffiss Air Force Base in New York in October 1954. The next American jet speed record would be set only two months later, on 20 August by Commander Turner Caldwell, USN, reaching 640.744 miles per hour (1,031.178 km/h) while flying the turbojet-powered Douglas Skystreak D-558-1 No. 1. 47-0205 (FAU213) – Museo de la aeronautica in Montevideo, Uruguay. ^ Royal Air Force jets had made the first crossing of the Atlantic in the reverse direction two weeks earlier. ^ Aviation historian Norman Polmar states three, but Joseph Baugher lists serial and bureau numbers for four: 44-85000 and −85005 became 29667 and 29668 with 44-85235 and 45-8557 becoming 29689 and 29690. ^ See also Gloster Meteor F8 "Prone Pilot" for background on prone pilot experiments. ^ Green and Swanborough 2001, p. 345. ^ a b c d Felton, James. "Shooting Star." Life, 13 August 1945, pp. 43–46. Retrieved: 25 November 2011. ^ Gunston 1989, p. 59. ^ Heppenheimer, T.A. "The Jet Plane is Born." American Heritage magazine, Fall 1993. Volume 9, Issue 2. Retrieved: 1 August 2011. ^ Ethell and Price 1994, p. 180. ^ Dutton, Mark. "Maj Frederic Austin "Fred" Borsodi." Archived 8 May 2018 at the Wayback Machine Find a grave, 6 August 2010. Retrieved: 5 August 2013. ^ a b "Lockheed F-80 "Shooting Star." Archived 4 October 2011 at the Wayback Machine The 456th Fighter Interception Squadron. Retrieved: 1 August 2011. ^ Dorr, Robert F."Project Extraversion: P-80 Shooting Stars in World War II." Archived 9 October 2013 at the Wayback Machine Defense Media Network. Retrieved: 5 August 2013. ^ Bilstein 2001, p. 179. ^ a b "P-80 Shooting Star/44-85200." Archived 12 January 2015 at the Wayback Machine National Museum of the USAF. Retrieved: 9 October 2012. ^ a b Polmar 2001, pp. 12–14. ^ a b Knez, Saso, Diego Fernando Zampini and Joe L. Brenan. "Korean War Database." Archived 4 June 2013 at the Wayback Machine AirCombat Information Group, (ACIG), 28 October 2003. Retrieved: 6 July 2008. ^ "USAF Credits for the Destruction of Enemy Aircraft, Korean War." Air Force Historical Study 81, p. 46. Retrieved: 1 August 2011. ^ a b Fitzsimons 1978, p. 2319. ^ Jones 1975, p. 202. ^ Andrade 1982, p. 81. ^ Andrade 1982, p. 126. ^ Andrade 1982, p. 143. ^ Andrade 1982, p. 167. ^ Andrade 1982, p. 239. ^ Andrade 1982, p. 263. ^ "P-80 Shooting Star/49-0433." Archived 2 February 2015 at Wikiwix aerialvisuals.ca. Retrieved: 30 January 2015. ^ "P-80 Shooting Star/49-0787." Archived 2 February 2015 at Wikiwix aerialvisuals.ca. Retrieved: 30 January 2015. ^ "P-80 Shooting Star/44-83020." Archived 29 April 2011 at the Wayback Machine NASM. Retrieved: 10 June 2011. ^ "P-80 Shooting Star/44-84999." Archived 23 April 2013 at the Wayback Machine Hill Aerospace Museum. Retrieved: 6 May 2013. ^ Baugher, Joe. "1944 USAAF Serial Numbers (44-83886 to 44-92098)". JoeBaugher.com. Archived from the original on 10 July 2015. Retrieved 16 June 2015. ^ "P-80 Shooting Star/44-85123." Archived 15 December 2016 at Wikiwix Air Force Flight Test Museum Inventory. Retrieved: 12 January 2015. ^ "P-80 Shooting Star/44-85125." Archived 23 June 2015 at the Wayback Machine Air Zoo. Retrieved: 6 May 2013. ^ "P-80 Shooting Star/44-85391." Archived 8 May 2013 at Wikiwix Air Victory Museum. Retrieved: 6 May 2013. ^ "P-80 Shooting Star/44-85488." Archived 9 August 2017 at Wikiwix Planes of Fame Museum. Retrieved: 9 October 2012. ^ "P-80 Shooting Star/45-8357." Archived 29 July 2013 at the Wayback Machine Museum of Aviation. Retrieved: 6 May 2013. ^ "P-80 Shooting Star/45-8490." Archived 14 November 2016 at the Wayback Machine Castle Air Museum. Retrieved: 12 January 2015. 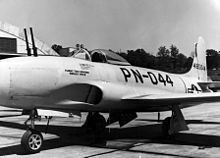 ^ "P-80 Shooting Star/45-8501." Archived 23 June 2015 at the Wayback Machine aerialvisuals.ca. Retrieved: 30 January 2015. ^ "P-80 Shooting Star/45-8517." Archived 1 February 2015 at Wikiwix aerialvisuals.ca. Retrieved: 30 January 2015. ^ "P-80 Shooting Star/45-8612." Archived 24 February 2015 at the Wayback Machine Pima Air & Space Museum. Retrieved: 12 January 2015. ^ "P-80 Shooting Star/45-8704." Archived 28 March 2015 at the Wayback Machine Aerospace Museum of California. Retrieved: 12 January 2015. ^ "P-80 Shooting Star/47-0171." Archived 2 June 2015 at the Wayback Machine aerialvisuals.ca. Retrieved: 30 January 2015. ^ "P-80 Shooting Star/47-0215." Archived 31 January 2015 at Wikiwix aerialvisuals.ca. Retrieved: 30 January 2015. ^ "P-80 Shooting Star/47-1392." Archived 23 June 2015 at the Wayback Machine aerialvisuals.ca. Retrieved: 30 January 2015. ^ "P-80 Shooting Star/48-0868." Archived 23 June 2015 at the Wayback Machine EAA Airventure Museum. Retrieved: 12 January 2015. ^ "P-80 Shooting Star/49-0432." Archived 12 October 2014 at the Wayback Machine USAF Armament Museum. Retrieved: 6 May 2013. ^ "P-80 Shooting Star/49-0696." Archived 23 June 2015 at the Wayback Machine National Museum of the USAF. Retrieved: 9 October 2012. ^ "P-80 Shooting Star/49-0710." Archived 29 June 2015 at the Wayback Machine Mid-America Air Museum. Retrieved: 30 January 2015. ^ "P-80 Shooting Star/49-0719." Yanks Air Museum. Retrieved: 18 October 2018. ^ "FAA Registry: N729A." Federal Aviation Administration. Retrieved: 18 October 2018. ^ "P-80 Shooting Star/49-1853." Archived 1 February 2015 at Wikiwix aerialvisuals.ca. Retrieved: 30 January 2015. ^ "P-80 Shooting Star/49-1872." Archived 25 December 2016 at the Wayback Machine Pueblo Weisbrod Aircraft Museum. Retrieved: 30 January 2014. ^ United States Air Force Museum Guidebook 1975, p. 52. ^ "P-80 Shooting Star/47-0205." Archived 31 January 2015 at Wikiwix aerialvisuals.ca. Retrieved: 30 January 2015. ^ Loftin, L.K. Jr. "Quest for Performance: The Evolution of Modern Aircraft NASA SP-468." Archived 13 June 2006 at the Wayback Machine NASA. Retrieved: 22 April 2006. ^ Roux 2007, p. 213. Andrade, John. Latin-American Military Aviation. Leicester, UK: Midland Counties Publications, 1982. ISBN 0-904597-31-8. Arnold, Rhodes. Shooting Star, T-Bird & Starfire: A Famous Lockheed Family. Tucson, Arizona: Aztex Corp., 1981. ISBN 978-0-8940-4035-1. Baugher, Joe. "Lockheed P-80/F-80 Shooting Star." USAAC/USAAF/USAF Fighter and Pursuit Aircraft, 16 July 1999. Bilstein, Roger E. Flight in America: From the Wrights to the Astronauts. Baltimore, Maryland: Hopkins Fulfillment Service, Johns Hopkins University Press, 2001. ISBN 978-0-8018-6685-2. Dorr, Robert F. "P-80 Shooting Star Variants". Wings of Fame Vol. 11. London: Aerospace Publishing, 1998. ISBN 1-86184-017-9. Fitzsimons, Bernard, ed. "Shooting Star, Lockheed F-80/T-33." Illustrated Encyclopedia of 20th Century Weapons and Warfare, Volume 21. London: Phoebus, 1978. ISBN 0-8393-6175-0. Green, William. War Planes of the Second World War, Volume Four: Fighters. London: MacDonald & Co., 1961 (Sixth impression 1969). ISBN 0-356-01448-7. Green, William and Gordon Swanborough. WW2 Aircraft Fact Files: US Army Air Force Fighters, Part 2. London: Macdonald and Jane's Publishers, 1978. ISBN 0-354-01072-7. Gunston, Bill. World Encyclopedia of Aero Engines. Cambridge, UK: Patrick Stephens, 1989. ISBN 1-85260-163-9. Jones, Lloyd S. US Fighters, Army-Air Force: 1925 to 1980s. Los Angeles: Aero Publishers, 1975. ISBN 0-8168-9200-8. Polmar, Norman. "Lots of Shooting Stars". Naval History (United States Naval Institute), Vol. 14, No. 4, August 2001, pp. 12–14. Roux, Élodie. Turbofan and Turbojet Engines: Database Handbook. Raleigh, North Carolina: Éditions Élodie Roux, 2007. ISBN 978-2-9529380-1-3. United States Air Force Museum Guidebook. Wright-Patterson AFB, OH: Air Force Museum Foundation, 1975. Wooldridge, E.T. Jr. The P-80 Shooting Star: Evolution of a Jet Fighter (Famous Aircraft of the National Air and Space Museum Series, Vol. 3). Washington, D.C.: Smithsonian Institution Press, 1979. ISBN 0-87474-965-4. Wikimedia Commons has media related to Lockheed P-80 Shooting Star.